Medical form fill seal trim machine designed for high quality medical packaging of medical products by producing a ‘Surlyn soft bottom’ Tyvek pouch. Bulky medical products such as tubing sets and surgical procedure kits can either be manually loaded or automatically loading into vacuum formed Surlyn and Tyvek pouches. DESCRIPTION: The 25/200-FST Series are automatic form/fill/seal & trim types of inline packaging machinery designed to run: blister packs, portion packs, medical trays, unit dose packs, etc., and other packages requiring form/fill/seal & trim. Plastic film is formed into multiple #-up blisters/trays, operators load product into them, a lidstock is placed over the package, which is then heat sealed and die cut into individual packages and dispensed from the end of the machine. Roll fed (random or registered preprinted may be used) lidstock such as: Tyvek, paper, foil, laminates, etc. may be used. 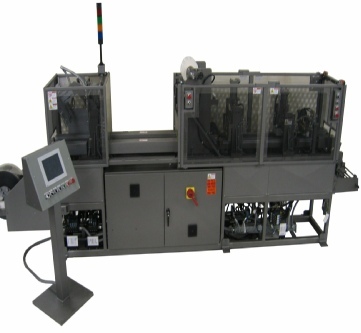 Date code and specialized printing systems, as well as automatic product feeders can be easily added to this machine.